Xinjiang-Uigur autonomous region is situated in the utmost western part of China, in the very center of Asia, between the Tien Shan and Kueng Lung mountain massifs. Right in the middle of this area there lies the barren Taklamakan Desert -'the river of sand' as the Chinese call it. However, the region has rather turbulent past. The oases in the northern and southern parts of Xinjiang were populated and developed as far back as the ancient times: the biggest settlements were Miran, Hotan and Markend in the south; Turfan, Karashar and Kashgar in the north. Through these oases ran the important caravan routes of the ancient Asia, the ones which later were called the Silk Routes. Silk - the China's secret, monopoly and valuable currency equivalent - was exported along these routes. As far back as the beginning of the 1st century A.D. there existed a busy two-way caravan traffic along the Great Silk Road: from China westward and from the West eastward. The annals of the Chinese dynasty of Hang tell about the different directions of the caravan routes running through Xinjiang. One of the roads ran from Labnor Lake to the domains of the Usuls on Issyk-Kul Lake - through Turfan, Urumchi, and the valley of the Ili River called 'the Northern River'. Another road led to the state of Davan (Ferghana) - through the Tarim River valley, the Taklamakan Desert, Yarkend, Kashgar, and the mountain passes of the Tien Shan. The merchants usually preferred the southern route, since the northern oases were subjected to regular attacks of brigands. The most significant town on the southern route was Hotan. 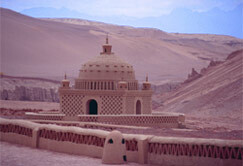 The oldest monuments in Xinjiang can be traced in this very city. Buddhism, for a long time a prevailing religion of Xinjiang, was brought to Xinjiang by merchants and migrants from India. From Xinjiang Buddhism spread to China and Central Asian countries. 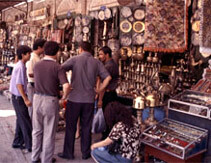 Thus, together with various goods, caravan routes also carried cultural and spiritual values. And Xinjiang, hosting these routes served as a bridge connecting the East and the West. 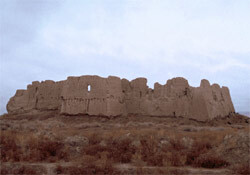 The architecture of the medieval Xinjiang has preserved mostly in ruins. As in the entire Central Asia, the main building material in the region was the adobe brick pakhsa - earth and straw mixture dried in the sun. They used this flimsy material for building dwelling houses, fortifications and temples. The Buddhist cult constructions were mostly temples for prayng, often housed in caves, and monasteries. 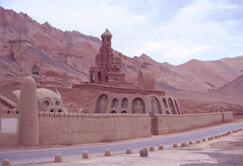 Hotan temples are typical specimens of such constructions. As a rule, these were small buildings which had square central part surrounded by niches with Buddha statues. The interior of the temples was decorated with wall-paintings and sculptures. These specimens of the Oriental medieval art are of great interest. The distinctive style of Xinjiang artists can still be seen in their depiction of real animals - camels, horses and bulls. The images of fabulous monsters have a significant place in the artistic expressiveness of ancient masters. In the ruins of Xinjiang temples there were found the remains of many statues and mouldings. Typical of them are the reliefs from the temple in Ravaka, near Hotan. The reliefs represent a row of Buddhist saints in dresses either hanging in heavy folds or flying away as if in the wind. The burial statuettes representing a deceased man's household and suite are remarkable for their liveliness free from religious canons. The most ancient specimens of wall-paintings were found in Miran, one of the southern oases. They date back to the 3rd century A.D. The evident high level of craftsmanship makes us suppose that there were deep-rooted painting traditions in Xinjiang. It is very clearly seen in the wall-paintings of the cave temples and monasteries. However, along with purely Buddhist traditions, they bear similarity to Sogdian paintings found in Uzbekistan and Tajikistan. In the 7th - 8th centuries Xinjiang had close connections with the state of Tang. These connections were also maintained later, when the Turkic Uigurs conquered Turfan and founded an independent princedom. Owing to its position on the Great Silk Road, Uigur state acted as an intermediary between China and the countries of West Asia. Having borrowed Buddhism from China the Uigurs pursued the building traditions too, and wonderful temples and monasteries appeared in the area. The most preferred were colorful monumental compositions of Buddha surrounded by gods and monks. 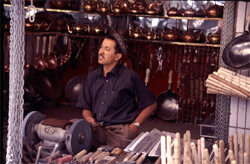 The devastating conquest of the Tatar Mongols in the 13th century had a dramatic effect on the economy and culture of Xinjiang. In the late Middle Ages the development of less dangerous and more advantageous sea routes to India and the Far East bereaved Xinjiang of its former international importance. In the middle of the 18th century Eastern Turkestan and Jungaria were annexed to China and got the name 'Xinjiang' ('New Border'). Following the victory of the people's revolution in 1949, there was made good progress in all spheres of the country's life. In 1955 the province of Xinjiang was reorganized into Xinjiang Uigur Autonomous District. The present Xinjiang occupies one sixth of China's territory and borders Russia, Mongolia, Kazakhstan, Kyrgyzstan, Tajikistan, Afganistan, Pakistan and India. The Chinese have a saying: 'You will never know how great China is without visiting Xinjiang'. Most of Xinjiang's territory is occupied by Jungar and Kashgar Plains, Tarim Basin and the Taklamakan Desert. The plains are separated by the ranges of the Eastern Tien Shan which are seven thousand meters high. By contrast the Turfan Basin, which is also located in Xinjiang, is the lowest in Central Asia: it is 154 meters below sea level. The climate is droughty, extremely continental. Summers are hot, winters are frosty but snow-free. Most of the area's rivers drain through oases before ending in lakes or being swallowed up by the sands, including the Tarim river. The basis of Xinjiang's economy is agriculture. The staple crops, characteristic of Central Asia, such as wheat, maize, rice and cotton, occupy more than 50 per cent of the province's cultivated lands. Horticulture, viticulture and melon-growing are also common. In the north the population is engaged in breeding sheep, goats, cattle, camels and horses. Xinjiang is one of the Chinese centers of oil production and refining. The province is to play an important part in the construction of pipe line that is to connect Kazakhstan and the countries of Asian Pacific region. If this project is successfully implemented, China will get additional sources of oil and gas. In Xinjiang there is also mined coal, rare and precious metals, mica, graphite, nephrite. There have been developed metallurgical, machine building, chemical, textile and building materials industries here. The traditional crafts of silk weaving and carpet making are still being practiced and developed. The basic transport facilities in the area are the railroad Lanchjou - Urumchi and a system of motor roads. Urumchi is connected with Beijing and other Chinese cities by air routes. Kashgar is a typical Xinjiang city, where the past and present are intertwined in a most peculiar way: yashmak and a woman on a motorcycle; adobe quarters and modern hotels; a dervish on the steps of a mosque and Chinese pioneers with red ties. One can see an old man dressed in a national caftan and scull-cap and talking over the mobile phone, a barber working with an open blade razor right on the city square and the latest Japanese electric shavers in one of the central department stores. The most remarkable sight of the city is Idkakh Mosque, built in 1442. It was destroyed during 'the cultural revolution', but restored in later period. Now the mosque is surrounded by gardens. Its courtyard can accommodate up to 20 thousand worshippers. 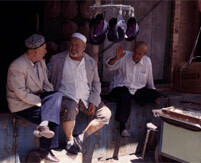 Xinjiang is an integral and important part of modern China. Yet it is ancient and unique country populated by strong, patient and hardworking people who are on their way to national accord and democracy.